Dear Jesus, Mary and all saints … I surrender my new job at Qatar at your feet, I am thankful to all that first process of Indian approval is through. 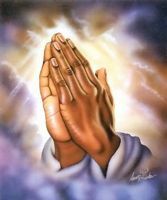 I beg all to pray that conversion of work permit in my name to go smoothly. I surrender my parents, sister, bro in law and another sister for their job, peace, happiness and love. I pray for my wedding on 07th May 2012 with heera. I pray all our preparation goes well and have a better future. I surrender my new job at qatar. The conversion of work permit to my name is going, i pray all gets through without much hurdle.. Prayer for peace in the world.